A slate of candidates opposed to closing an elementary school and higher elementary class sizes will hold four seats on the school board. 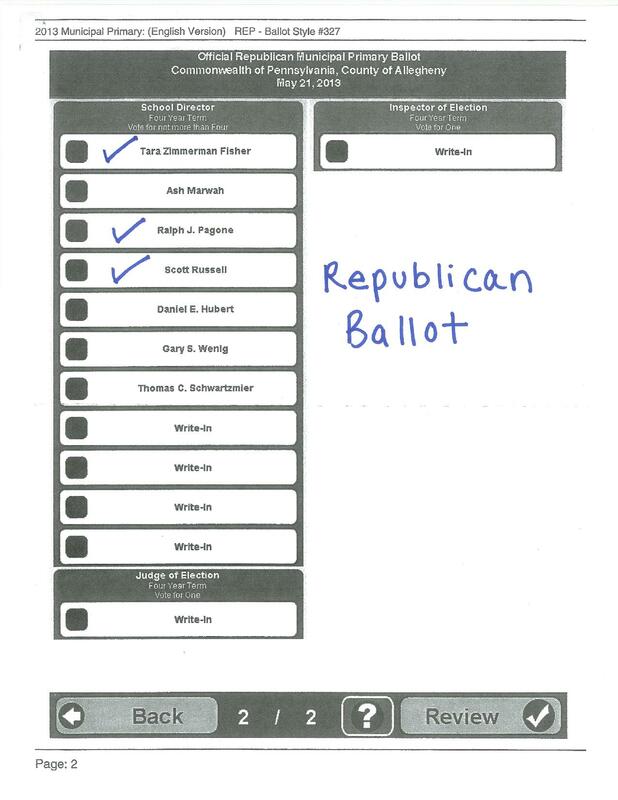 Because three candidates endorsed by the Save NA Schools group won nomination in May on both the Democratic and Republican tickets, the race was basically between incumbents Thomas Schwartzmier on the Republican ballot and Daniel Hubert on the Democratic ballot for the fourth four-year term. Mr. Schwartzmier received 62 percent of more than 5,300 votes to defeat Mr. Hubert. Tara Zimmerman Fisher, who received the most votes (4,917), Scott Russell and incumbent Ralph Pagone were the other winners. 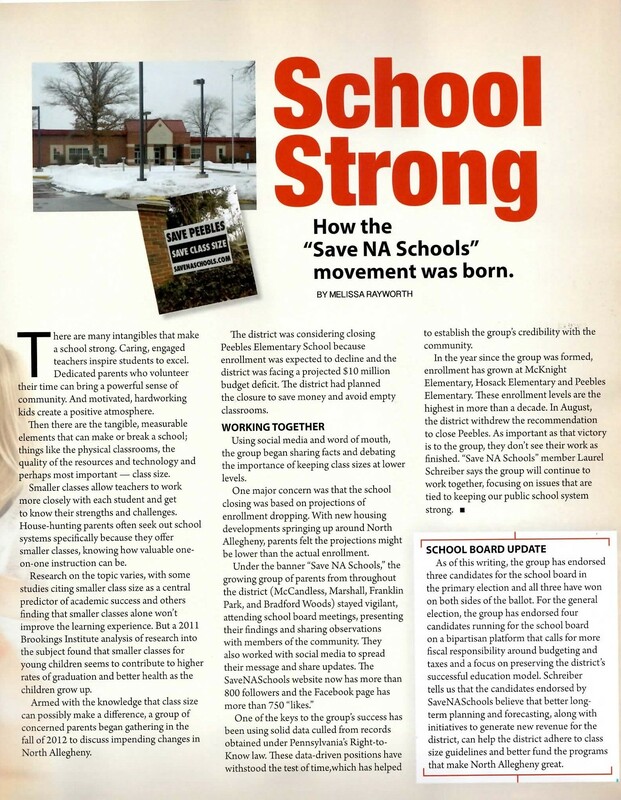 “It’s incredible to see what has been achieved by a group of thoughtful, committed residents in this district,” said Mrs. Fisher, a 1994 graduate of North Allegheny. “The results of yesterday’s election were a huge win for the current students, future students, and taxpayers of the North Allegheny School District,” Mr. Pagone said. A candidate endorsed by Save NA Schools also took the two-year term created when Beth Ludwig resigned. Kevin Mahler, who was running as an Independent, defeated the endorsed Republican candidate, Gary Wenig. The Democrats did not nominate a candidate for the special election. With the election, seven of the nine school board seats will be held by McCandless residents. Mr. Schwartzmier lives in Franklin Park, while board President Maureen Grosheider lives in Marshall. Linda Bishop, who also lives in Marshall, did not seek re-election. Vote Today to Move the District Forward! 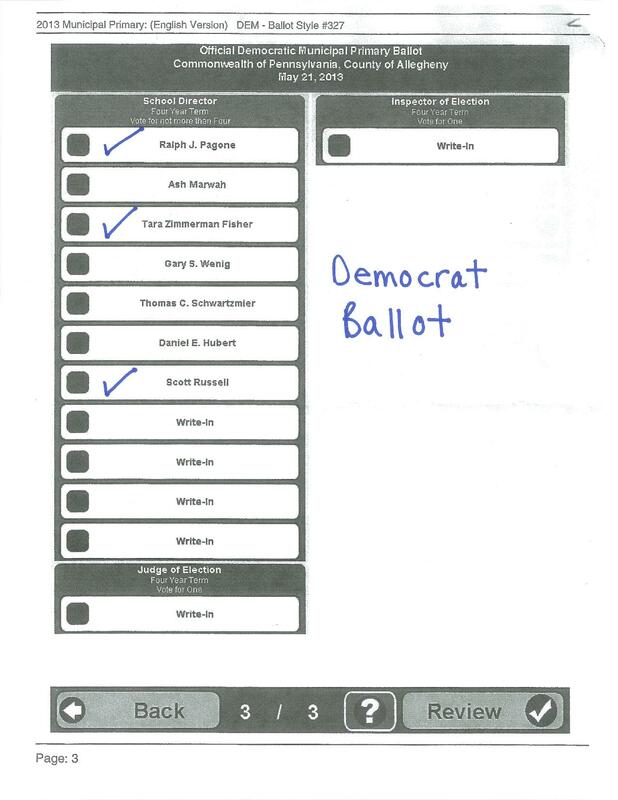 Vote FISHER-PAGONE-RUSSELL and don’t select a fourth candidate on your ballot. Thank you for your support! “NA United” is comprised of a small group of people, primarily from Marshall Township, including Board President Maureen Grosheider, Board Member Linda Bishop, and Vice Chairman of the Marshall Township Board of Supervisors, Phil Troy. 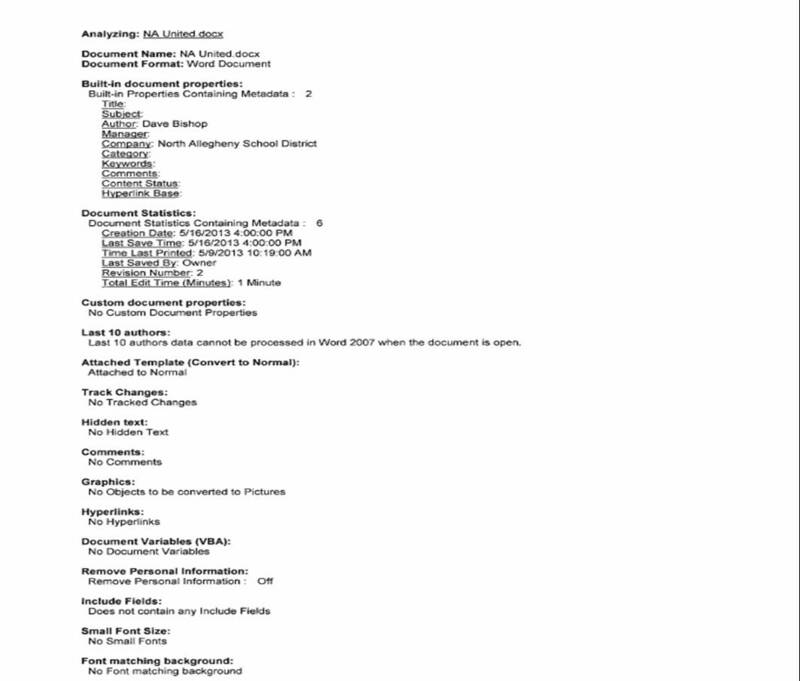 Metadata retrieved from a Microsoft Word document being circulated by “NA United” identifies Ms. Bishop’s husband as the author of the document and the North Allegheny School District as the company. In our opinion, this begs the question—was Ms. Bishop, or any other member of “NA United,” using taxpayer-funded District resources for political purposes? A copy of the metadata report is shown below. Ms. Bishop, Mr. Troy, and Ms. Grosheider want to see Dan Hubert re-elected and the status-quo preserved. Mr. Hubert has been on the school board since 1999. In an effort to maintain control, the “NA United” group has made several attempts to discredit newcomers Fisher and Russell. This is most directly evidenced by Mr. Troy contacting PFA and PTA presidents, who are precluded from taking a political position, and encouraging them to endorse Hubert-Wenig-Schwartzmier. Mr. Troy is also responsible for spreading false rumors that Fisher and Russell would close Bradford Woods. Meanwhile, no fear-mongering or negative campaigning has been undertaken by the other township organizations that are supporting candidates in this election. These groups have played by the rules in an effort to protect the integrity of the political process and allow the best candidates to prevail. 1) All three candidates have a vested interest in providing a quality education to students across the district–they are parents with elementary, middle, and high school students at North Allegheny. These candidates advocated for extra sections to correct class size, which is now included in the district’s 2013-14 plan. 2) All three candidates possess a strong skill set for moving the district forward–Ms. Fisher is a business professor and CPA, Mr. Pagone is a manager for an engineering/construction company, and Mr. Russell is an IT Director. These candidates advocated for new initiatives with respect to technology and STEM education, which are now included in the district’s 2013-14 plan. 3) All three candidates are proponents of financial stewardship–they believe the district should budget and plan for future obligations to ensure the best use of taxpayer funds. 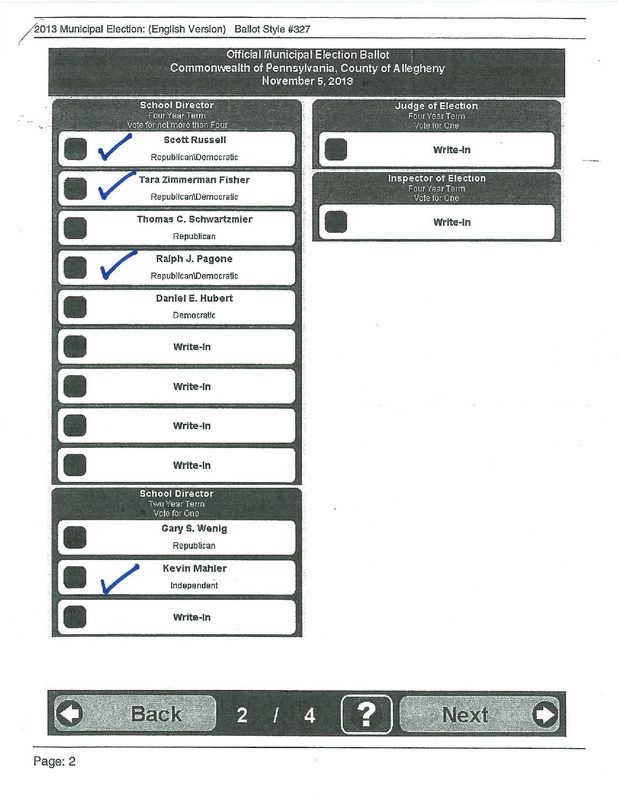 These candidates advocated for a PSERS reserve fund, which is now included in the district’s 2013-2014 plan. 4) All three candidates are advocates for the community–they believe residents should have a voice in matters that impact them. These candidates advocated for a community advisory committee to explore cost saving measures, which is now included in the district’s 2013-2014 plan. 5) All three candidates received a public school education and understand the value of public schools in our community–Ms. 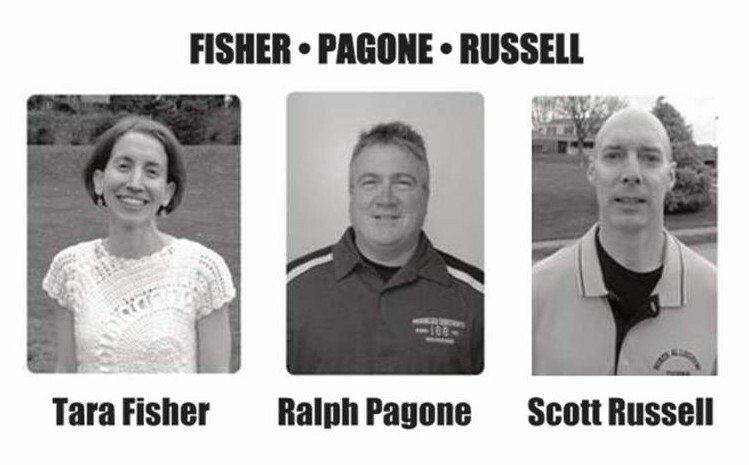 Fisher and Mr. Pagone are graduates of North Allegheny, and Mr. Russell is a graduate of Penn Hills. These candidates advocated for preserving the district’s successful education model, which postponed the vote on the closure of Peebles Elementary. Our endorsed candidates, FISHER-PAGONE-RUSSELL, have support from residents across the district because they have spent the last several months advocating that ALL SEVEN elementary schools should remain open in order to preserve the district’s successful education model. By taking a district-wide approach, making fact-based arguments, and being passionate about education, our candidates have gained much recognition. We believe their credentials and community service are further testaments to their character and we have included a profile on each of them below. Tara (Zimmerman) Fisher grew up in Franklin Park and graduated from North Allegheny. She has an undergraduate and graduate degree in accounting from the University of Virginia. Ms. Fisher started her CPA career with PricewaterhouseCoopers in Washington, DC and was later assigned to their U.S. Tax Desk in London, England. She also spent several years working for Congress as an accountant with the Joint Committee on Taxation. Ms. Fisher and her husband, Ryan, moved from Washington, DC to Pittsburgh six years ago so that they could be near family and raise their 3 children (ages 7, 5, and 3) in the North Allegheny School District. 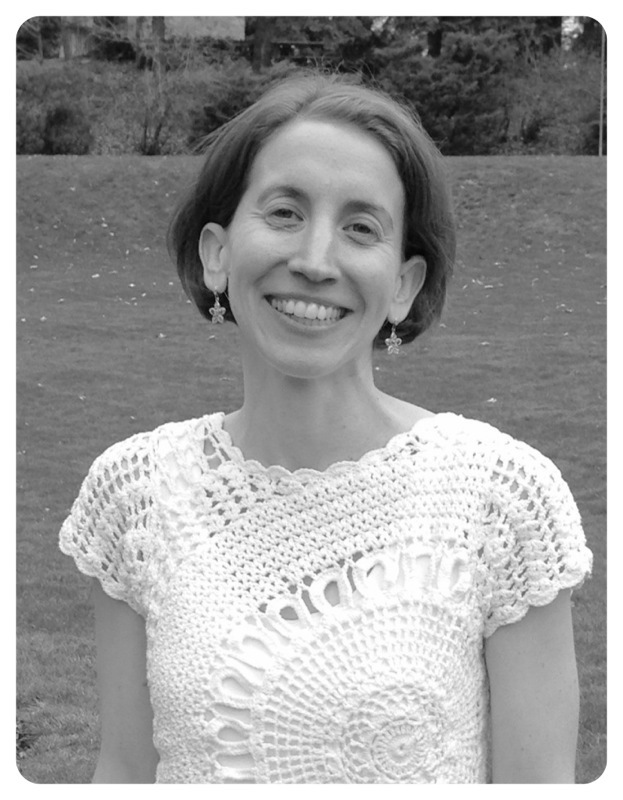 Ms. Fisher is a part-time business professor at the University of Pittsburgh and she enjoys teaching tax and accounting classes to undergraduate and graduate students. She also serves on the Memorial Park Christian Preschool Board. Ms. Fisher believes the district needs a long-term financial plan to preserve the programs and curriculum associated with North Allegheny’s elite status. She wants to help the board budget and plan for future obligations so that the district is effective in making strategic decisions (e.g. establishing a reserve for state mandated pension contributions). She also wants to help the district forge ahead in areas like STEM education (Science, Technology, Engineering & Mathematics). She believes a tuition-based STEM education program could help the district generate new revenue. Ralph J. Pagone grew up in McCandless and graduated from North Allegheny High School. He also attended the University of Pittsburgh and has an Associate’s Degree in Mechanical Engineering Technology. Mr. Pagone and his wife, Bridget, have 4 daughters: two that graduated from North Allegheny, one at NASH, and one at Carson Middle. He is the Regional Manager for Richard Goettle, Inc., a geotechnical engineering and construction firm. Mr. Pagone is an active member of the community. He has been a volunteer firefighter in the Town of McCandless for nearly 30 years. Mr. Pagone was responsible for implementing Fire Prevention Week safety visits at McKnight Elementary over 15 years ago and they still continue today. 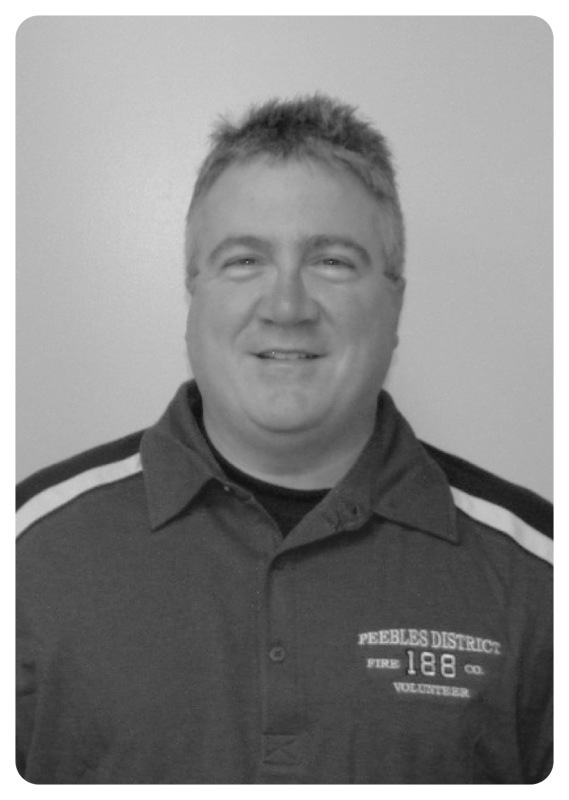 He also is a CPR and First Aid instructor throughout the North Allegheny community. 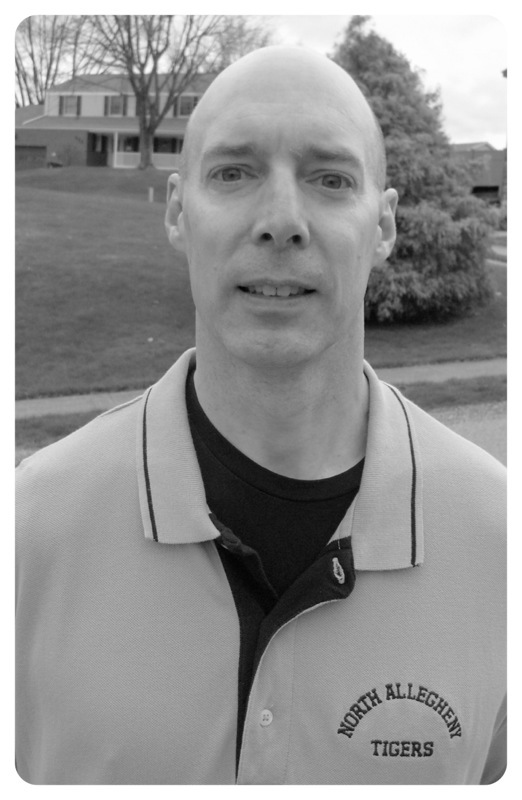 Mr. Pagone has been active in the Ingomar/Franklin Park Athletic Association, McCandless Athletic Association, and is the Head Coach of the North Allegheny Varsity Girls Slow-Pitch Softball team. Mr. Pagone has served on the North Allegheny School Board since 2005. During his time on the school board, Mr. Pagone has been integral in implementing several initiatives for the betterment of the district. These initiatives include the construction of a new Student Council room at NASH, the creation of fitness trails at NAI, the implementation of a new CPR program for 9th grade students, and the expansion of the district’s drug prevention policies. Mr. Pagone recently submitted a report to the board that includes a variety of options for raising funds via alternative revenue sources. Scott Russell grew up in the Pittsburgh area and graduated from Penn Hills High School. He earned a degree in Computer Science from Indiana University of Pennsylvania. Mr. Russell has 4 children: two at Carson Middle, one with special needs at Marshall Middle, and one at Hosack Elementary. Mr. Russell is the IT Director for General Nutrition Centers (GNC), which is headquartered in Pittsburgh. He started his career with GNC 25 years ago as a programmer analyst. Mr. Russell is also an active member of the community. He has coached soccer, flag football, and served on the board of the Cystic Fibrosis GNC Challenge. His wife, Eileen, has served as the President of the Hosack PFA for two separate terms. Mr. Russell believes the district needs a sound IT strategy to better prepare our students for the information age. He would like to help guide that process to make sure the district is meeting the needs of students, teachers, and parents. As a director at a large company, Mr. Russell is also equipped to confront the financial challenges facing the district. He has experience establishing and managing budgets, while considering the future needs of the organization. In addition, his hands on experience with special needs will provide the board with additional insight and sensitivities related to students with disabilities. Mr. Russell’s background in IT, financial planning, and special needs can benefit the district on many levels.